Windows :: Tomo I - Número Total de Páginas:: 124 :: ISBN: 84-7608-110-3. Windows :: Tomo II - Número Total de Páginas: 124 :: ISBN: 84-7608-111-1. 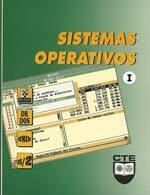 Sistemas Operativos :: Tomo I - Número Total de Páginas:166 :: ISBN: 84-7608-116-2. Sistemas Operativos :: Tomo II - Número Total de Páginas: 146 :: ISBN: 84-7608-117-0. 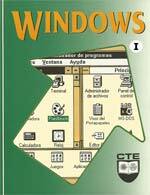 Aplicaciones Windows :: Tomo I - Número Total de Páginas: 160 :: ISBN: 84-7608-114-6. 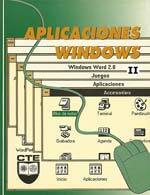 Aplicaciones Windows :: Tomo II - Número Total de Páginas: 176 :: ISBN: 84-7608-117-0. 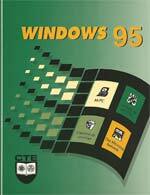 Windows '95 :: Número Total de Páginas: 76 :: ISBN: 84-7608-121-9. 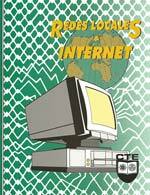 Redes e Internet :: Número Total de Páginas: 210 :: ISBN: 84-7608-131-6. 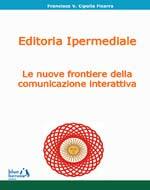 Editoria ipermediale: Le nuove frontiere della comunicazione interattiva :: Totale pagine: 220 :: ISBN: 88-901526-0-5. Interazione uomo-computer nel XXI secolo: Analisi e valutazione euristica della qualità per la comunicazione e l’usabilità :: Totale pagine: 160 :: ISBN 88-901526-1-3. Podcasting e new media: Miti e realtà nella comunicazione multimediale e l'educazione a distanza :: Totale pagine: 180 :: ISBN: 88-901526-5-6. Quo vadis informatica, etica ed estetica? :: Quo vadis informática, ética y estética? :: Quo vadis computer science, ethics and esthetics? Totale pagine: 412 :: ISBN: 978-88-96471-06-7. 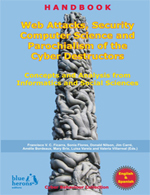 Web Attacks, Security Computer Science and Parochialism of the Cyber Destructors: Concepts and Analysis from Informatics and Social Sciences (English and Spanish edition). Pages: 242 :: Número Total de Páginas: 242 :: ISBN: 978-88-96471-46-3. Video Games and Aesthetic Function of Computer Graphics in Multimedia Systems: Software and Communicability Strategies. Editing in Progress :: ISBN: 978-88-96471-72-2. 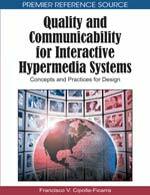 Quality and Communicability for Interactive Hypermedia Systems: Concepts and Practices for Design. ISBN: 978-88-96471-06-7. 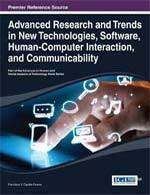 Advanced Research and Trends in New Technologies, Software, Human-Computer Interaction and Communicability. ISBN: 978-14-66644-90-8. 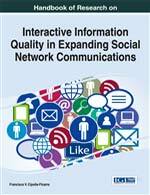 Handbook of Research Interactive Information Quality in Expanding Social Network Communications. ISBN: 978-14-66673-77-9. 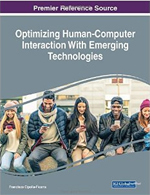 Optimizing Human-Computer Interaction With Emerging Technologies. ISBN: 978-15-22526-16-2. 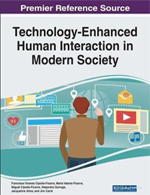 Technology-Enhanced Human Interaction in Modern Society: ISBN: 978-15-22534-37-2. Handbook of Research Software Quality Innovation in Interactive Systems. Work in progress. 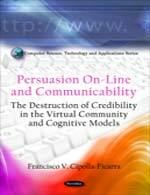 Persuasion On-Line and Communicability: The Destruction of Credibility in the Virtual Community and Cognitive Models. ISBN: 978-1-61668-268-2. HCI and the Excellence in Animations and Digital Games. Work in progress. Pulp-Computer Interaction. Work in progress. The "G" Factor. Work in progress. Co-editors: Jacqueline Alma (Vancouver, Canada), Kaoru Sumi (Hakodate, Japan), Rosa Smurra (Bolonia, Italy), Alejandro Frangi (Sheffield, UK), Andreas Kratky (Los Angeles, USA), José Hamkalo (Buenos Aires, Argentina), et al. It is the only field where there still is a process of rapid democratization between the advances of the hardware and the software 3D and the potential users of the latest breakthroughs in the digital screens. Simultaneously and irrespective of the size of the plasma screens and whether they are intended for individual use (mobile phones, watches, etc.) or collective (TV screens, cinema, etc.). There is a constant opening of perspective for the development and use of graphic computing in 2D and/or 3D. Starting from this democratization process, there are new points of view for the anlysis, experimentation and the development of interactive systems, the architecture of online information, the realism of the dynamic and/or static images, the quality of interactive communication among the users, among so many other components, which derive from the 3D programming, and application of the pixels to the new technologies. Therefore, the objective of this handbook is not only to gather the current state of the art, but also project the future lines of research and development in the short, middle and long run. Some lines of research that are interesting and essential not only for the educational sector, but also for the industrial and commercial sectors. Two-stage submission: First, interested researchers and practitioners are invited to submit a chapter proposal clearly stating your focused domain problems and contributions related to one of the above topics due on (proposal submission deadline is open. Consequently, as they are received, they will be evaluated; in other words, it is not necessary to wait until the deadline to send them for the evaluation); second, authors of accepted proposals will be notified by between two and three week/s, after the submission about the status of their proposals and sent chapter organizational guidelines. Full chapters are due by May, 1st. All submitted chapters will be reviewed on a triple-blind review basis. The handbook is scheduled to be published in 2019 by Blue Herons Editions (Canada, Argentina, Spain and Italy). For additional information regarding the publisher, please visit www.blueherons.net. Co-editors: Ana Pérez. 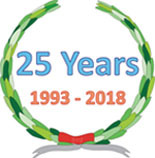 (Seville, Spain), Annamaria Poli (Milan, Italy), Francesca Bocchi (Bolonia, Italy), Daniela Tamburini (Milan, Italy), Claudio Germak (Turin, Italy), Derrick de Kerckhove (Toronto, Canada), et al. Currently there is a wrong tendency to bring together all the disciplines derived from the formal and factual sciences in the Human-Computer Interaction and Software Engineering, that is, aeronautic, electronic, industrial, nuclear, ... engineers, foreign literatura, mathematics, physics. anthropologists, fine arts, and a long etcetera. One of the sectors that is the most harmed in this epistemological deviation of the sciences in the last quarter of a century is and will remain to be the third level educational sector, that is, the university. Especially the future generations of professionals for the creation of novel interactive contents in keeping with the context, as well as the use and dissemination of the ICTs. Therefore, one of the main goals for this handbook is to establish what technologies are valid in the learning and teaching process, depending on where the final user, that is, professor or student, has been included. Simultaneously, to investigate the influence of the new means of social communication, especially social networks, in the process of enculturation and transculturation. Another of the priority goals is the analysis of the methods and techniques used to evaluate this process between the computer user and the multimedia contents, from the design of the interactive systems to the final version of the same, having gone previously through the test phase and possible corrections. In short, it aims to examine all those positive aspects that derive from the use of the new technologies in the teaching-learning process, and that can be enhanced through the evaluation techniques applied to software and hardware. Two-stage submission: First, interested researchers and practitioners are invited to submit a chapter proposal clearly stating your focused domain problems and contributions related to one of the above topics due on (proposal submission deadline is open. 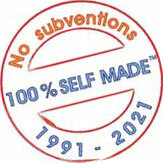 Consequently, as they are received, they will be evaluated; in other words, it is not necessary to wait until the deadline to send them for the evaluation); second, authors of accepted proposals will be notified by between two and three week/s, after the submission about the status of their proposals and sent chapter organizational guidelines. Full chapters are due by July, 31th. All submitted chapters will be reviewed on a triple-blind review basis. The handbook is scheduled to be published in 2019 by Blue Herons Editions (Canada, Argentina, Spain and Italy). For additional information regarding the publisher, please visit www.blueherons.net. Co-editors: Anna Parodi (Rome, Italy), Jacqueline Alma (Vancouver, Canada), Kaoru Sumi (Hakodate, Japan), Wen-Yuan Jen (Taiwan, China), Diego González (Bolonia, Italy), Gustavo Hirchoren (Buenos Aires, Argentina), et al. In this editorial project, we focus on one of the sectors that are currently drawing the attention of a high number of scientists, which is quantum computing and all its derivations of the main theoretical-practical advantages of its use. That is to say, a new global revolution in the context of new information and communication technologies. The progressive decrease of the hardware and the potential increase of the calculation speed of the processors in tiny technological devices of the static or dynamic type, allows to simulate structures and systems that currently belong to the realm of science fiction. The minituarization of the hardware, joined to the potential of the software, will radically transform the social communications in the educational, health, labor sytems, etc. Besides, the rise of the use of artificial intelligence, together with the quantum technologies, will be an indispensable resource for the resolution of a myriad problems that currently have no solution, or which require great investments in human and/or financial capital. In this first approach to the possible advantages, a serious bridge will be established, which respects and ponders, each one of the components of the epistemology of the sciences, within human-computer interaction and quantum computing. The motivations of this demand are due to the fact that it is intended to encompass two fundamental areas, for all humankind, in the 21st century, such as: nature and society. Therefore, we focus on the potential use of software and new technologies, applied to nature such as agriculture, social communication within the global village, education, and medicine, and other topics that we summarize as follows: communication, computer graphics, information theory, metrics, simulation, quantum phenomena oriented to nature and society, artificial intelligence, mobile and ubiquitous computing, ICTs applied to agriculture, ecosystems and environment, etc. which does not mean that others can be submitted for inclusion, due to their notoriety or impact factor, in the immediate future. The present handbook encourages high quality, originality, clarity, singularity, precision and significance, chapters to eliminate uncertainty of meaning and increasingly all research works. Its core main themes include: computing and quantum technologies, interactive design, communicability, human-computer interaction, interfaces, database, cloud computing, networking, education, big data challenges, information retrieval and management, bio-informatics, real-world applications of intelligent techniques. Other related and emerging themes and topics are also welcome. In short, research areas and main topics suitable for publication include, but are not limited to the following fields or areas (see here). Two-stage submission: First, interested researchers and practitioners are invited to submit a chapter proposal clearly stating your focused domain problems and contributions related to one of the above topics due on (proposal submission deadline is open. Consequently, as they are received, they will be evaluated; in other words, it is not necessary to wait until the deadline to send them for the evaluation); second, authors of accepted proposals will be notified by between two and three week/s, after the submission about the status of their proposals and sent chapter organizational guidelines. Full chapters are due by October 1st. All submitted chapters will be reviewed on a triple-blind review basis. The handbook is scheduled to be published in 2019 by Blue Herons Editions (Canada, Argentina, Spain and Italy). For additional information regarding the publisher, please visit www.blueherons.net. Co-editors: Jacqueline Alma (Vancouver, Canada), Wen-Yuan Jen (Taiwan, China), Andreas Kratky (Los Angeles, USA), Carlos García-Garino (Mendoza, Argentina), Diego González (Bolonia, Italy), Tom Murphy (Dublin, Ireland), et al. :: Chapter Proposal Submission Deadline: Closed. :: Proposal Acceptance Due Date: Closed. :: Full Chapter Submission Deadline: Closed. :: Planned Publishing Date: Closed. The computerized societies of the 21st century are going through a period of great uncertainty towards the horizons drawn as limits to improve the quality of living of their inhabitants in 2020. A myriad projects have been developed since the start of the financial crisis of the new millennium. However, the ordinary citizen does not really see the advantageous and positive results of the intersection between computer science and daily life. Quite the opposite, the digital divide increases with every passing hour, between the educational-scientific context and the average citizens, who sustain such research. The current book intends to restore the first four cardinal points that must guide the future research with the goal set on 2030, such as Software Engineering, Mobile Communicability, Cloud Technologies, and Big-data. In that sense, we focus on compiling all those contributions where the originality and creativity of the different proposals are present as well as a rich theoretical-practical framework for all those interested in going deeper into each of the topics and subthemes that are treated throughout each of the chapters. Chapters where the lessons learned and the future lines of research contribute to find the north in the field of the computational science and engineering, always placing the human being at the centre of that research. We encourage submission with innovative solutions, active research projects, etc. from areas related to software engineering, mobile multimedia systems, interactive design, communicability, cloud technologies, big-data, smart cities, information and communication technology, etc., and related disciplines Besides, the present handbook encourages high quality, originality, clarity, singularity, precision and significance chapters to eliminate uncertainty of meaning and increasingly unify all research works in computer science, education, design/evaluation/production of systems for mobile devices, applications and experiences in data visualization, cloud technologies, solutions for smart cities and communities, human-computer communication, etc. More information about the topics, see here. Two-stage submission: First, interested researchers and practitioners are invited to submit a chapter proposal clearly stating your focused domain problems and contributions related to one of the above topics due on (proposal submission deadline is open. Consequently, as they are received, they will be evaluated; in other words, it is not necessary to wait until the deadline to send them for the evaluation). Second, authors of accepted proposals will be notified by between two and three week/s, after the submission about the status of their proposals and sent chapter organizational guidelines. Full chapters are due by December, 15th. All submitted chapters will be reviewed on a triple-blind review basis. The handbook is scheduled to be published in 2018 by Blue Herons Editions (Canada, Argentina, Spain and Italy). For additional information regarding the publisher, please visit www.blueherons.net. Title: "Handbook of Research Software Quality Innovation in Interactive Systems"
Title: "Human-Computer Interaction and the Excellence in Animations and Digital Games"